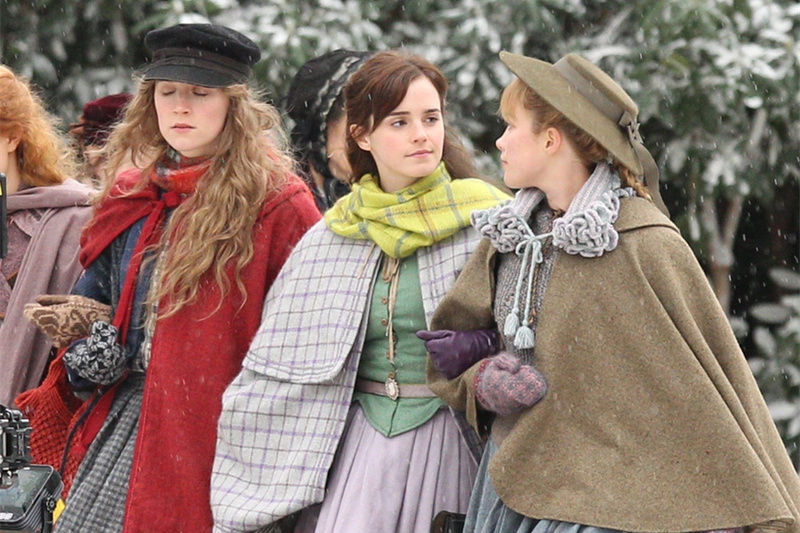 Emma Watson was transformed into the beautiful Meg March as she joined Saoirse Ronan to film the Little Women remake in snowy Harvard on Monday. The 28-year-old Harry Potter star was all wrapped up in period costume to film the lavish adaptation of the 19th Century novel. Meanwhile Saoirse, 24, also got into character as the bookish Jo March, sporting the classic Victorian attire as they filmed on location in Boston. In 1994, Winona Ryder starred in another remake as Josephine March, a young women who dreams of becoming a successful author. And in 2017, The BBC aired a miniseries version of the novel which featured Michael Gambon and Angela Lansbury. Saoirse and Emma will star alongside Florence Pugh, Timothée Chalamet, and Meryl Streep in the latest box office offering which is slated for release on Christmas Day 2019. It will be directed by Greta Gerwig, who earned much critical acclaim last year for her work on the coming of age film Lady Bird, which also earned Saiorse an Academy Award nomination for Best Actress. Emma's role was originally intended for Emma Stone, according to Variety, who reported that she was unable to commit to the role, as she is currently working on The Favourite.